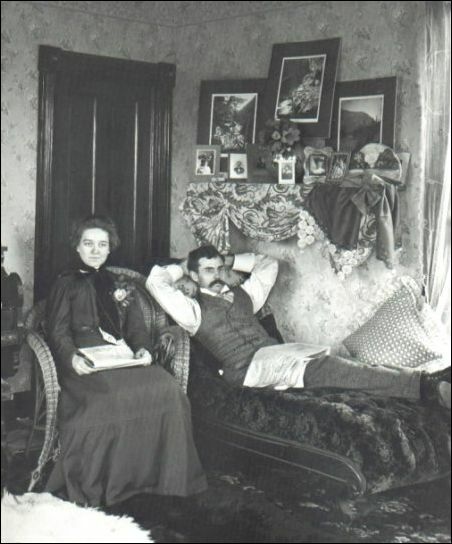 Tabitha and Darius in the parlor of their Talcott Street home, Oct. 11, 1900. Photo courtesy of the book, Kinsey Photographer The three volumes of the book are still for sale and vintage copies are advertised widely on the Internet. Darius Kinsey (1869-1945) is recognized as one of the group of photographer geniuses who lived in the Pacific Northwest and produced a very large body of work in the years around the turn of the 20th Century. We provide links below to several stories in the Journal that result from our own research, from the best books about Kinsey and articles by other writers. Many readers have shared scans of Kinsey photos with the Journal from their family collections. Almost of those photos were developed from negatives and glass plates that are now part of the Kinsey collection at the Whatcom Museum and we indicate below how you can contact the museum for copies or to help identify particular photos. In our companion article, we share our own research of Darius and his family and you can read our notes from the three-volume set of Kinsey Photographer, by Dave Bohn and Rodolfo Petschek, which has become a bible for Kinsey lovers. We share a summary here. Kinsey came to the Northwest with his family in 1889, at age 20, and they soon opened a hotel and other businesses in Snoqualmie, which was then just a small village and depot on the Seattle Lake Shore & Eastern railroad line. He began taking photos for the SLS&E's northern branch that stretched to Sumas and met his prospective bride, Tabitha Pritts, near the village of Nooksack in 1894. After marrying in 1896, they lived in Sedro beginning in 1897 and set up a thriving photo studio there. While in Sedro-Woolley, he generated income from studio photographs but soon began trekking into the North Cascades mountains and following logging crews into the foothills. Those areas would eventually become his preferred venues and his studio work lessened, and Tabitha became his partner and darkroom specialist while he traipsed off into the woods, seeking both views and customers. The Kinseys moved to Seattle during the holiday season of 1906-07 and he set up a company that eventually became known as "Timber Views" in a home and studio on East Alder Street and a decade later in the Greenwood district. During that post-Sedro-Woolley period, he increased his emphasis on the logging railroads and especially the locomotives and crews that were felling timber in remote areas throughout the Northwest. Darius kept at work until he was 71, but fell off a stump in the fall of 1940 and October of that year is the last recorded date of his negatives. He died on May 13, 1945, in Sedro-Woolley. In our companion article, you will read our new research into why he was back here at the time. Jesse Ebert, the owner of Aerolist Photographers and a small photo studio in West Seattle, approached Tabitha a year after Darius's death and bought the entire collection of Kinsey photographs and negatives — on both glass plate and film. Darius had been adamant that the collection was not to be fragmented or sold piecemeal and Ebert agreed to that. 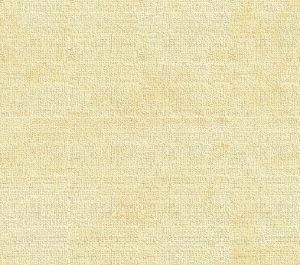 Starting in 1952, Ebert was represented by Sam Emmanuel and Paul Sirlin, who began marketing the collection nationwide. Over the next 25 years, various institutions considered buying the collection but none offered what was Ebert's minimum. The University of Washington had an opportunity but passed on it and the Yale School of Forestry low-balled their offer. None of the major logging companies saw the value for public relations or corporate image-building. 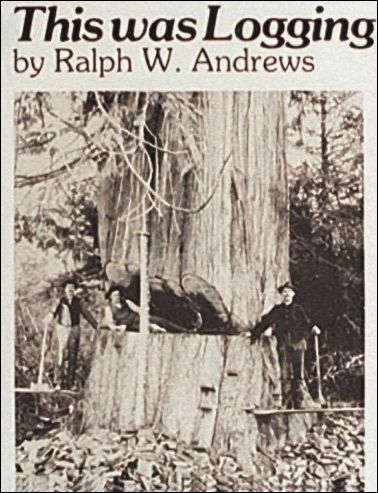 In 1953, Ralph Andrews, an author with the Superior Publishing Company, received permission to publish copies of the photos in a series of famous logging books that started with This Was Logging! in 1954. Andrews was the initial key in reviving interest and respect in Kinsey. In 1962, John Szarkowski of Museum of Modern Art in New York City approached Ebert and arranged to exhibit Kinsey's work as part of an exposition in November that year that included 19 landscape photographers who were active from 1867 to 1962. Only six practiced before 1900 so Kinsey's work was compared with these five other contemporaries: Timothy H. O'Sullivan, William Henry Jackson, Henry Hamilton Bennett, Edward Steichen and Alfred Stieglitz. Even that national exposure, however, did not stimulate serious buyers until writers Dave Bohn and Rodolfo Petschek showed interest after seeing a Kinsey photo on the cover of the February 1970 issue of the old Seattle magazine. Bohn met with Ebert in March 1971 and discovered that he had more than 3,000 11 x 14-inch negatives. After reaching a tentative deal with Ebert, Bohn met with Petschek three months later and they agreed to jointly purchase the collection. 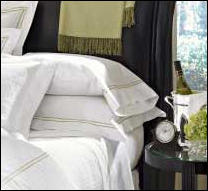 We recently visited our newest sponsor, Plumeria Bay, which is based in Birdsview, just a short walk away from the Royal family's famous Stumpranch, and is your source for the finest down comforters, pillows, featherbeds and duvet covers and bed linens. Order directly from their website and learn more about this intriguing local business. That marked the beginning of an intricate three-year research project by the authors while they also sought key negatives, plates and photographs that had escaped the collection. The collection increased by more than 50 percent by the time they were through. During that period, Petschek spent a year in his darkroom, developing photographs from the unwieldy glass plates and transferring the images from those plates and from flammable nitrate stock onto safety negatives. After vital input from nearly two dozen researchers and experts in the Northwest, Bohn and Petschek published three Kinsey books over the next nine years. In the fall of 1975, in conjunction with the opening of the Oakland Museum exhibit of "Kinsey Photographer," the authors published the first two volumes of their books by the same name. After a reviewer mentioned that the work should be shared with readers at a price less than the pricey $150 label for the excellent hardbound books from Scrimshaw Press. So the authors worked with Chronicle Books in San Francisco and in March 1978 they reprinted the combined two volumes of Kinsey Photographer, adding a third printing that fall after the first 10,000 were gobbled up. I have a two-volume Chronicle hardbound printing of 1982. Both volumes are headed: "A half-century of negatives by Darius and Tabitha May Kinsey." Volume One is sub-headed, "The family album and other early work," and includes the earliest surviving negatives from 1890 through work in Sedro-Woolley ending in 1906, along with the authors' research of Kinsey's work and genealogy of the Kinsey and Pritts families. Volume Two is sub-headed, "The Magnificent Years." In 1984 they published Volume Three, The Locomotive Portraits, which they assembled from 41 11 x 14-inch glass-plate negatives that Kinsey shot for large-format prints that he sold to the lokey crews and crews who shipped their logs via railroad. The authors supplemented the stunning photos themselves of both geared- and rod-steam locomotives with additional photos of speeders and rail trestles. And to explain the photos they added essays on each locomotive by a railroad historian, John Labbe, and excerpts from interviews with longtime engineers, firemen and brakemen. All through the process of creating their books, Bohn and Petschek stated that their ultimate goal was to return the collection to Washington state and specifically to an institution that would commit to maintain it and restore the images to their original glory. Starting in 1976, George E. Thomas of Bellingham's Whatcom Museum of History and Art began preparing to house the collection. In mid-1978, Dave Bohn traveled to Seattle to listen to the museum's plan and both sides agreed that the integrity of the collection was the key to the project. After the authors transferred the collection that December, Thomas began raising funds from corporate and philanthropic sponsors. The collection had grown to about 5,300 pieces after Kinsey descendants Dottie Parcheski and her husband, Michael Ryherd, contributed vintage prints and after the authors collected hand-colored prints that were tinted by Tabitha and Alfreda Kinsey, her niece and darkroom assistant. Once the project was funded and legally organized, the museum's former curator, Rod Slemmons, joined darkroom specialist Lori Niedenfuer and photographic technician Craig Garcia as they began to organize the collection. The Whatcom Museum Kinsey/Biery etc. collections Three decades later, the Kinsey collection is in fine shape, as is the Galen Biery collection and others, now in the hands of Jeff Jewell, Photo Archives Research Technician and Toni Nagel, Photo Archivist/Curator of History. Whatcom Museum of History & Art acquired the Ebert collection in 1979. Every time I have visited the Museum, I have come away impressed with what those specialists have done to share Kinsey's vision and skill with a new generation. I am especially impressed with the research they have done to add important details. They have reached out to experts in the fields of logging, photography and railroads, as well as local historians to identify people in the photos, and to determine the equipment, the locale and the time period. This has required a great deal of time and dedication because, as Bohn and Petschek emphasized, they found very little documentation to go with the prints and negatives. Maybe you, too, can help them with particular pieces. They emphasize that the museum has been collecting archival materials since 1940. The Museum Photo Archives primarily focuses on photographic material, with an emphasis on regional photographers and subject matter, and the Kinsey collection is just one of their priority projects along with others such as the Galen Biery and Bert Huntoon photo collections and the Edson & Irish collection of early Whatcom memorabilia and printed matter. Thousands of researchers from all over the world contact the Photo Archives each year in order to purchase copies of images from the photograph collections. The clarity and quality of images provide visual aids for illustrations in books, calendars, videos and a wide variety of other uses. 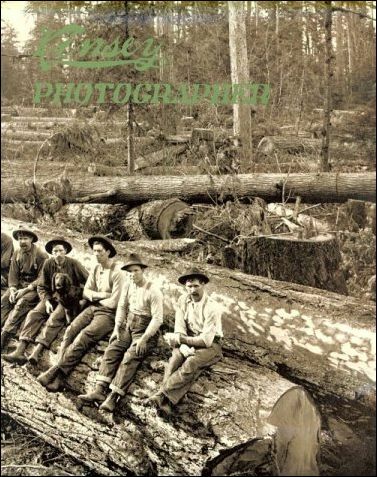 Ray Jordan's profile of Darius Kinsey, Sedro-Woolley's ace photographer who revolutionized photography of logging and the North Cascades. He lived in Sedro-Woolley, as base of his operations, from 1896-1906 at the beginning of his career, before moving to Seattle and establishing his Timber Views studio. "When it came to capturing on film in amazing detail the splendors of the deep woods and colorful characters that inhabited them, we think Darius (Dee) Kinsey was without a peer. And considering the vagaries of poor light in the tall timber and his primitive equipment, his accomplishments are all the more remarkable." — Jordan. See the story of Tabitha Pritts Kinsey, recalling in 1953, as a widow, their family and professional life and her very vital role as a partner. Profile of Jesse Ebert and his success in placement of Kinsey photos at The Museum of Modern Art by 1979. And Whatcom Museum of History & Art bought the collection right after the MOMA feature. Tabitha Kinsey sold the collection to Jesse Ebert in 1946, a year after Kinsey's death. Ebert cared for the collection for 25 years before selling it to California photographers and publishers, Dave Bohn and Rodolfo Petschek. After documenting the collection and researching the lives of the Kinseys, Bohn and Petschek published the two-volume book Kinsey Photographer in the fall of 1975. See the Journal's extensive Logging Portal Section with more than a dozen links. Inventions that changed logging, starting in the 1880s. John Dolbeer's steam donkey and Ephraim Shay's railroad locomotive. These are two of the locomotive classes that Kinsey photographed. Whatcom Museum of History & Art webpage. We are proud to announce that next year, we will provide a definitive profile of nuclear unit of the Kinsey family and how the different brothers and descendants fared. There were many brilliant people in that family, and an argument can be made that Clark Kinsey had equivalent talent to Darius, and matched him at times in results. And the story, derived over nearly a decade from correspondence with Kinsey descendants who want the whole grand picture to be snapped, will lead you to places that might not associate with the Kinseys, including Gorst Aviation. Vern Gorst met Clark Kinsey in the Klondike gold fields and established his air business at Duwamish, at the end of Ivar's old pier on Elliott Bay and then launched seaplane service from Lake Union in the 1920s. Gorst shared the successes in those first days of expanded air service with another Northwest aviation pioneer, Bill Boeing, and Vern is credited with establishing the initial foundation of what would become United Airlines. And one of Clark's descendants was a key player in the Gorst era and following. Quite a panorama, which will be shared with our online-magazine subscribers (now in Issue 55) first (that's a hint). Issue 56 of the Journal Subscribers magazine will include our biography of Darius and Tabitha Kinsey through 1903, based on Dave Bohn and Rodolfo Petschek's biography and supplemented with our own research and correspondence with descendants over the last decade.